Double-checking the numbers on your natural gas meter never hurts, especially when the benefits involve saving energy and money. By learning how to read your gas meter, you can monitor your usage and avoid being overcharged or undercharged by the utility company. Locating your meter Gas meters are located inside the home, usually in the basement utility closet, or outside the home. Your gas meter resembles a metal box with pipes extending from it. The meter’s face has four round clock like dials with digits 0-9 displayed on each one. Locate the four dials in the row and always remember to read them from left to right. Also be aware that the pointer on the first dial of a gas meter circles counterclockwise, the second dial clockwise, the third counterclockwise and the fourth clockwise. Notice the pointer in each dial and write down the number indicated by its position. When the pointer is between two numbers, the reading for the dial is the smaller of the two numbers. If the pointer is directly on a number, that number is the reading. When you cannot tell if a pointer is directly on a number, look at the dial directly to the right. If the pointer on that dial has not passed zero, record the smaller number of the two. To discover how much gas you have used since your last bill, subtract the reading indicated on your last utility bill from the reading you just took. After this first reading you will be able to keep track of your own readings and compare them with your monthly utility bill. Gas is measured in either hundreds (Ccf) or thousands (Mcf) of cubic feet. Monitor your gas usage on a daily or weekly basis and take a reading to determine the amount you use in a single day or week. By following these steps, you will be better able to make changes in your lifestyle to keep your utility bills low and your energy savings high. Gas meter readings are taken on a monthly basis. Gas meter readings may be taken either by a technician directly viewing your usage as they walk from house to house or by an automated meter reading device which sends a signal to a computer that is in a vehicle or at a central office, and transmits the meter read. Either way, these methods assist the company in reducing the number of estimated meter reads it has to make, which are based on usage history rather than actual usage in a given month. 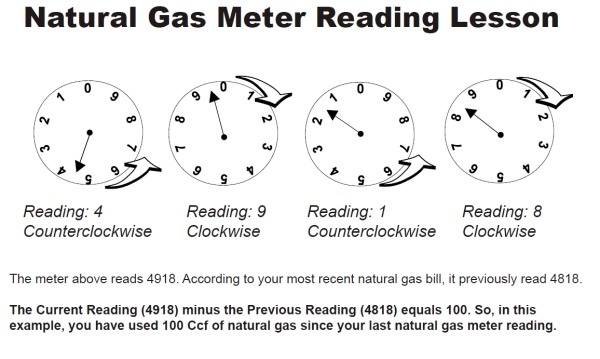 If you know your meter has not been read in the last 2 months, contact the company to schedule a reading date and then remember to take your own reading on that day as well. If you discover a sizable difference when comparing the readings, this could result in an overcharge or undercharge on your next billing statement. In either case, report the discrepancy to the utility. NOTE: Be aware that there are other components of a utility bill in addition to the basic rate which might affect the amount you are required to pay. Learning how to read your utility meters gives you a good indication of what your bill will be, rather than the precise amount you will pay.